Home > Main Gallery Page > Rose painting "Rainbow Niagara"
This rose oil painting is the result of a trip taken to see the Falls. We came across this rose in the garden located on the Canadian Side. They have a rose garden that rivals anything I've seen here in the U.S. and England. And the Brits can grow some roses! There is a tremendous amount of mist that comes from the falls, and this keeps these roses in plenty of moisture, both on the leaves and in the ground. They seem to flourish with no visible mold issues. Should you ever go there to see Niagara Falls, I do recommend seeing the Canadian Side and the many attractions there! Especially the rose and other botanical gardens. Oh, and visit the Falls too! It's one of those bucket list items that must be seen before you die. 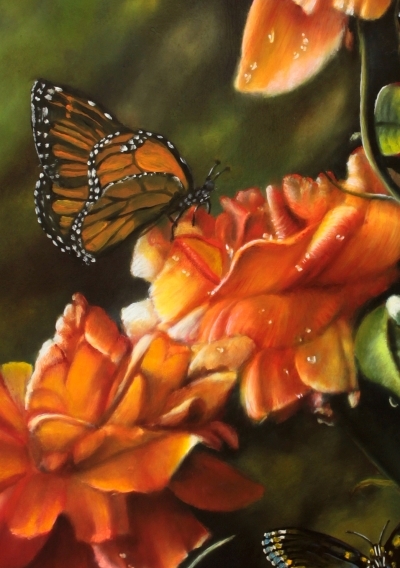 A trick I used in this painting to keep your interest in the flower blossoms themselves is to blur the background. It emphasized the blossoms and really show off the three colored petals. Cream, yellow and red. An appropriate name of the rose bush. 18" x 24" oils on cradled wooden panel, which means it doesn't need a frame, though you can put one on it should you decide to. 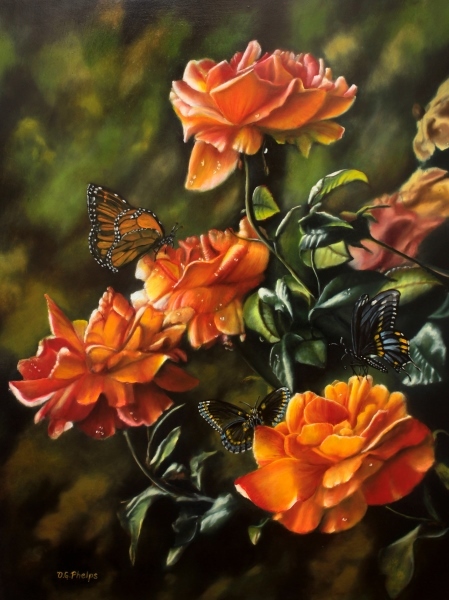 More details on a rose oil painting. Below you'll find some images and closeups of the painting. If you like it, why not "pin it" for your friends to enjoy. If you REALLY like it, please consider adding it to your collection. It can be found in my Etsy store. One of the things I remember about these roses that I wanted to capture was the sunlight as it passed through both the blooms, but the leaves. Some of them seem to glow. For those that have veiwed the demonstration on this painting, have you noticed anything different? The addition of the butterflies are my way of expressing these beautiful creatures. Global Warming has impacted them, and we see fewer and fewer. 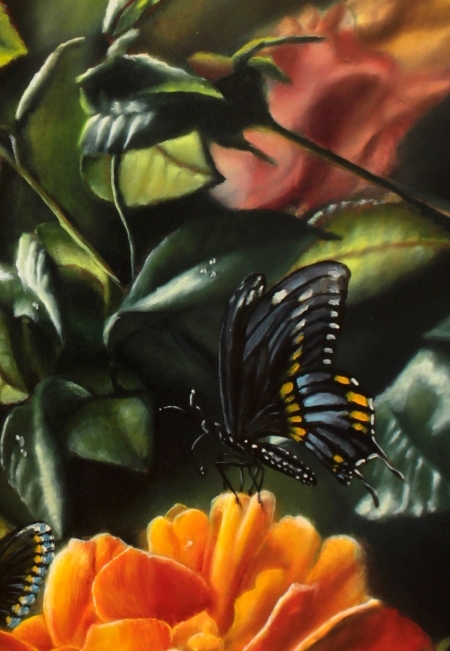 The 2 black ones are semi-hidden with dark backgrounds but your eye will pick up the subtle blues and whites of their wings and pull you into the painting closer to get a better glimpse. Of coarse, the Monarch near the center is the star of the show! Interested in more information on my painting method and guarantee when buying artwork online? Click the link to find out. Interested in seeing how this painting was created? Click here to see a short demo of the process. Both these links open in a new window so you don't lose your place. You can order this painting from my Etsy shop click here! It opens in a new window and sends you to my Etsy store. 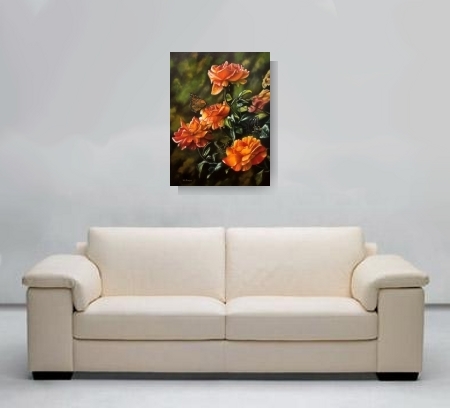 Click here to return to the Main Gallery page and leave this Rose Oil Painting.